Thanks to Chris Christie's ever-evolving Bridgegate debacle, it seems the GOP is scrambling to find a name to put on the 2016 Republican ticket. And it might just be Jeb Bush who runs for president — yup, Jeb Bush, the son of one former president and the brother of another. The former Floridian governor has said he'll decide whether to enter the residential race by the end of the year. Jeb is the younger of the two Bush sons, and graduated from the University of Texas, where he studied Latin American Affairs. In 1981, he moved to Florida, where he established a small real estate development company, that later became the largest, full-service commercial real estate company in the area. His political career began when he served as Florida governor Bob Martinez's secretary of commerce. 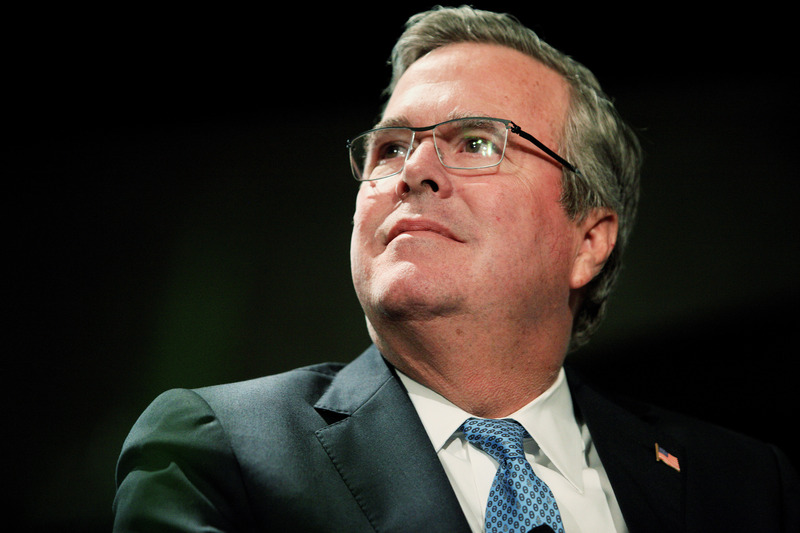 A trip down Jeb Bush memory lane: He first ran for governor of the state in 1994, but was defeated and instead turned to non-profit work, founding the Foundation for Florida's Future.This grassroots public policy organization successfully established Florida's first charter school - Liberty City Charter School - with the help of the Urban League of Greater Miami. Bush's interest in education extended to his time in the governorship, when he was elected for the first time in 1998, and again in 2002, thereby becoming the first Republican in the state's history to win reelection. As governor, he made education and education reform his top priority, which departed slightly from the GOP's national priorities agenda, in which education ranks fifth. Bush provided state public schools with a record-setting funding increase, setting aside $2.9 billion for K-12 institutions. Keeping with his conservative roots, he continued to cut taxes, holding them to their lowest levels in 10 years. He also took a surprisingly environmental turn in his administration, launching an accelerated restoration of America’s Everglades. This project, the larger than any other restoration project ever attempted, both saved wildlife and provided a steady source of drinking water for 8 million citizens of South Florida. Given his political track record and recent comments regarding immigration policies, it seems that Jeb Bush may not be as right-wing as some may hope. In fact, Bush called illegal immigration "an act of love," defending the actions of some immigrants who attempted to enter the country in order to be with or provide for their families. Recognizing the potential intra-party flack that he could receive from such a comment, he prefaced his on-air statement by saying "I'm going to say this, and it'll be on tape, and so be it." These stances seem to strategically align Bush with the historically hard-to-get minority vote for Republicans, and it seems that if the GOP is to stand any chance against Democratic front-runner Hillary Clinton, they're going to need some impressive artillery. We need to elect candidates that have a vision that is bigger and broader, and candidates that are organized around winning the election, not making a point. Campaigns ought to be about listening and learning and getting better. I do think we’ve lost our way...I’m not being critical of my party, but campaigns themselves are reflective of this new America. While Bush may have an impressive and seemingly bipartisan political resume, he is not without scandal. The younger Bush sibling is often accused of "stealing" the 2000 presidential election for his brother, an election that was famously won by Al Gore in the popular vote, but was ultimately decided in George W. Bush's favor in the electoral college. Jeb Bush seems inextricably linked to the coincidental stopping of the vote recount, which was settled by a margin of 537 votes in six million cast. While Jeb Bush may want to distance himself from the less-than-rosy legacy of his elder brother, it seems that lineage may embroil a political candidate in more ways than one — and the fate of Jeb Bush's presidential candidacy is yet to be determined.